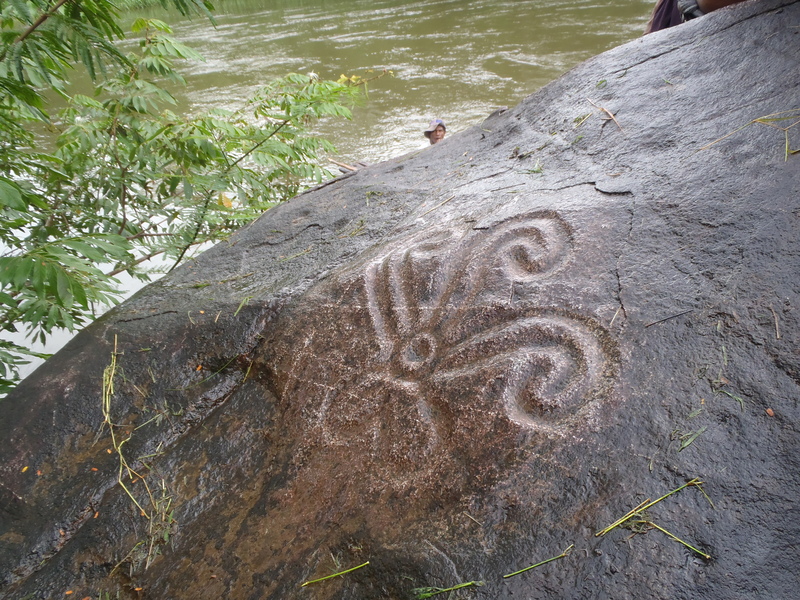 Archaeology of the Mosquito Coast | by Chris Begley, Ph.D.
A very unusual petroglyph in the Rio Platano near Las Marias. Most of the other reoccur often, and I have only seen a couple of others similar to this. This site is an effort to disseminate more widely the significant amount of information about the prehistoric Mosquito Coast, eastern Honduras, and the Bay Islands. Included are citations and a bibliography that may make the site useful to scholars, and hopefully of interest to non-specialists. A series of pages, in the title box above, address some of the main topics of interest regarding the archaeology of the Mosquitia. Periodic posts, in the menu to the right, will tend to have more graphics and photos. Linton and Faustino, Pech from the villages of Subirana and El Carbon, hold up two small metates, or grinding stones, at a site in the nucleus of the Rio Platano Biosphere. I am an archaeologist who worked in this area in various capacities since 1991, and I still have a sizeable backlog of things I would like to publish or otherwise make available. This site is part of that dissemination strategy. If you are researching the area, or just curious about any aspect of what is presented here, please email me at cbegley@transy.edu. Thank you for visiting, and I hope you find something of interest.